I thought this would be a good time to revisit those foods that are historically linked to Halloween. The recipes being featured today are from Ireland and they each have a unique association the holiday. We'll visit other countries next week. "Witches, ghosts, and goblins. Stealing down the street, knock on every door way, trick or treat!" The treat nowadays is candy, but the practice of dressing in costumes and going door to door for sweets dates back to the Middle Ages when the poor went begging for soul cakes. The cakes, which are actually cookies, were made for All Souls' Day. The devout mixed a measure of superstition with a dose of religion and believed that each cookie represented a soul that would be freed from Purgatory when the cookie was eaten. The cookies, called souls, were etched with crosses that clearly identified them as Alms for the dead and there was an expectation that a prayer would be said each time a cookie was eaten. Over time, the practice of souling was moved to All Hollows' Eve and the Alms for the dead were replaced with candy and other sweets. The cookies are a curiosity and it is their history that makes them interesting. 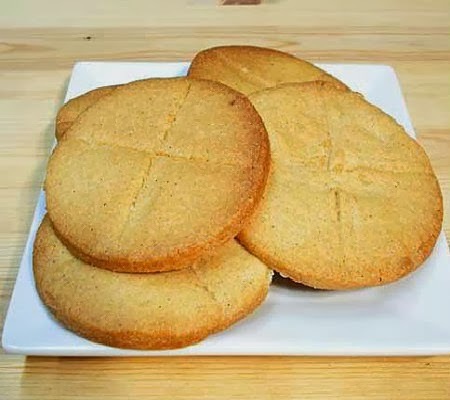 There are dozens of recipes for "souls", most of which make a spicy shortbread-type cookie. Actually, the cookies aren't bad when freshly baked, but they stale fast, so eat quickly and, for heaven's sake, don't forget to say your prayers. The recipe can be found here. Both Van Morrison and James Joyce mention barmbrack, a yeasted sweet bread that's traditionally served on Halloween in Ireland. The Irish sometimes called it Báirín (top) Breac (dirty or speckled). Years ago the yeast to raise the bread dough was skimmed from the top of a vat of fermenting beer, the Bairin. The dried fruit was the Breac. It is the custom in Ireland to place trinkets into the bread dough. The charms determine if luck in the coming year will be good or bad. If a pea is found, the finder will not marry. If a coin is found, good fortune and wealth can be anticipated. A small stick indicates a bad or violent marriage, a piece of cloth poverty and a ring an impending marriage. Some cakes contain all these objects and fate is determined by what's in the slice of cake you receive. For the superstitious it's not unlike a crap shoot. Like many women, I seed my bread in such a way that only good luck is bestowed on any who are at my table. The bread is not difficult to make and I'm a bit surprised that the tradition has faded in so many Irish-American families. 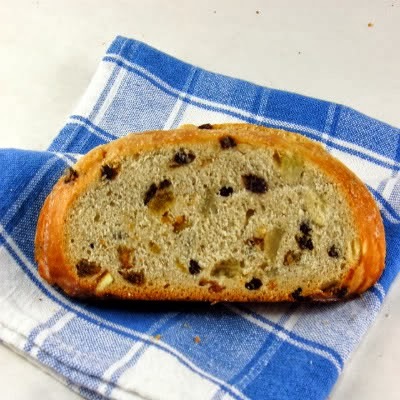 Soda bread is still made for St.Patrick's day but there are precious few families that still make barmbrack for Halloween. I have a pointer that will make your bread exceptional. In Ireland, the raisins and currants are steeped in tea for 24 hours before baking. At Chez Mary, they bathe in Jameson's Irish Whiskey. I have the happiest raisins in the Pacific Northwest. This is a lovely sweet bread. I hope you'll try it. The recipe can be found here. 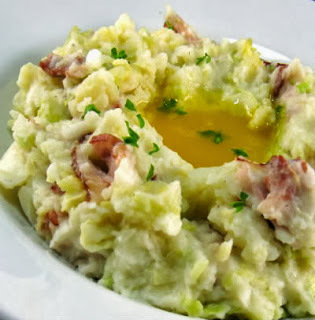 Colcannon, a traditional Irish dish associated with Halloween, is made with potatoes and savoy cabbage and served with a well of butter in its center. It's simple and delicious and comes with folklore that's sure to please the curious or superstitious. The tale, as told to me, concerns the fate of unmarried women who would put the first and last spoonfuls of Halloween colcannon into a stocking and hang it on their doors. Their shared belief was that the first man who walked through the door would become their husband. Immigration statistics and the birth rate, all those years ago, lead me to believe this didn't work real well. Back then, the ingredients used to make colcannon could be found in any Irish country garden. The second bit of blarney revolved around the selection of a cabbage from that garden by a blindfolded, unmarried woman. The cabbage she selected would be used to make a colcannon into which a ring was hidden. Of course, the person who found the ring would be the next to marry. I must warn you that my recipe for colcannon uses classic ingredients but techniques that my grandmother would frown upon. There are two or three steps to assembling any colcannon. The meat, if used, should be cooked before the potatoes and the cabbage are started. I use a slab of bacon to make mine. Ham can also be used. I simmer it in water for about 45 minutes before dicing it. My potatoes are conventional enough, though I do steam rather than boil them. I prefer to cook my cabbage in a wok. It's the easiest way I know to assure crisp tender greens that aren't water logged. When it all is assembled it looks like a traditional colcannon, but there will be a hint of smoke to play against crisp cabbage. The recipe can be found here. And I thought Halloween was about Kit-Kats and Reece's Peanut Butter Cups!! Happy Halloween! What an interesting post! I make a version of colcannon for St. pat's Day. I don't remember where I found the recipe but mine doesn't include the bacon or ham. I never knew of it's connection to Halloween either.